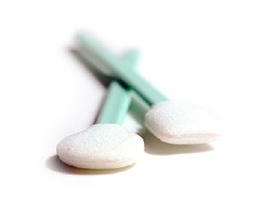 Texwipe CleanTips® swabs are engineered for superior cleanliness and consistency for a variety of applications. With nearly 40 different models, Texwipe has a swab that will provide the best contamination performance available. Texwipe swabs are available in a variety of options. Absorbond® Series - Hydroentangled continuous filament polyester heads. 100% virgin polypropylene handles. Alpha® Series - Cleanroom laundered 100% continuous filament knitted polyester heads. 100% virgin polypropylene handles. Cleaning Validation Series - Tools engineered to deliver consistent and accurate sample recovery for cleaning validation for both specific (HPLC, UV-Vis, IMS) and nonspecific (TOC) analytical methods. The swabs are effective with a wide range of diluents. Wondering which swab is right for your specific need? Swab Solvent Compatibility Chart - A comprehensive chart comparing swab head substrates with various solvents.